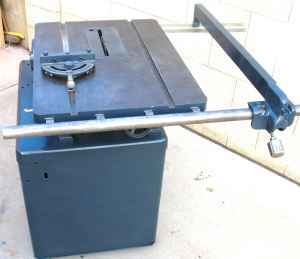 When Boice Crane announced the very first, low cost Boice Crane 10 Inch Table Saw, they incorporated big oversize ball bearing and a large oversize diameter saw-arbor to withstand punishing service sawing with big 10 inch blades. To this day, Boice Crane saws had a far greater overload capacity than other ordinary saws. In its present perfection, customers could feel confident that this Boice Crane Tilting Arbor was a more finely constructed, and a far superior performing machine than was being offered in its day at anywhere near their low price. Every detail in both construction and performance was shop-tested and it worth proved by thousands of installations in better shops throughout the entire world. In Boice Crane, customers got more highly refined construction, longer lived materials (no die-castings in any part subject to wear), bigger more costly ball bearings, bigger and stronger arbor, heavier all cast-iron rip fence, and many more fine features... all of which gave super accuracy of every conceivable saw cut... all with greater economy in first cost as well as in upkeep over a long period of years. 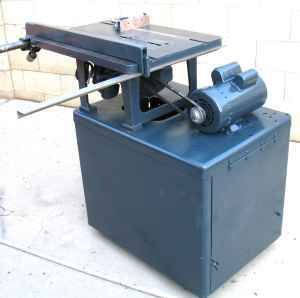 And no other Tilting Arbor Saw allowed you to make big economy of driving a big capacity saw by a low cost "standard" motor, or of driving both this saw and a six inch jointer with just one, standard low cost motor. No. 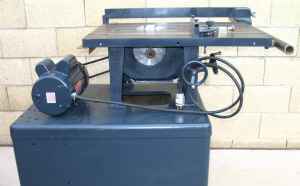 2500 Boice Crane Tilting and Lowering Arbor Saw with Ball Bearings. Includes micro-set ripping fence, combination extension bars, auto-set miter gauge, one 10-inch diameter rip blade (or cut-off or combination saw blade). 42" circumference V-belt, and arbor pulley for V-belt drive. 2. Adjustable Auto-Set screw to stop tilt of blade exactly at 45 degrees. A similar screw is provided for 90 degrees. Once set, always set. 3. Rotating Handle Crank very conveniently placed to tilt saw arbor. Ample clearance around it. No skinned knuckles. 4. 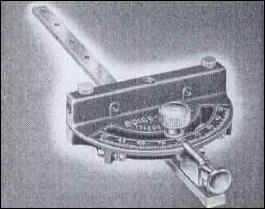 Degree dial indicates all angles to a split hair degree of accuracy. 5. Steel worm, and cast iron work wheel segment tilt saw arbor. both ar machine cut to last a lifetime. 6. Another Rotating Handle Crank. 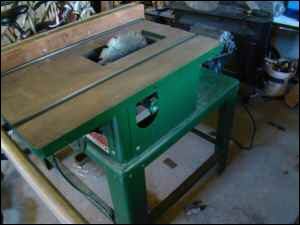 This one raises or lowers the saw arbor (table remains stationary). 7. Large Dust Chute of cast iron encloses lower portion of blade. Discharges sawdust downward away from the motor. 8. Totally Enclosed Gear Box keeps the spiral gears out of flying sawdust. Box is grease packed, for a lifetime of service. 9. Hand Lever locks vertical position of saw-arbor. This lock acts directly on the gibbed dovetail slide casting. Never slips. 10. Accurate Vertical Scale, fully visible, indicates exact depth of cut. 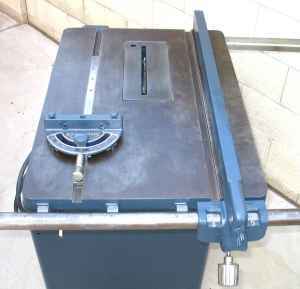 No need to stop machine to measure saw-projection with a rule. 11. Pointer for dept of cut. 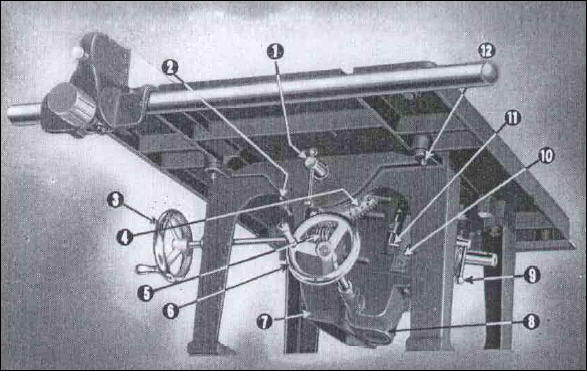 Adjusts for different projections of 6, 8, or 10-inch blades. Large taper dowel pins maintain exact position of the front trunnion casting. Never can shift out of alignment. Table Bars my be centered on ordinaly work or may be instantly extended to 21-inch capacity, as shown. A wood table extension may be readily attached to both bars. Ten Inch blade cuts 3" stock. Makes 45 degree miter thru standard 2 x 4's. Practical capacity for industrial users. An 8-inch blade is recommended for lighter work, cuts thru 2" stock. Blade lowers entirely below table. 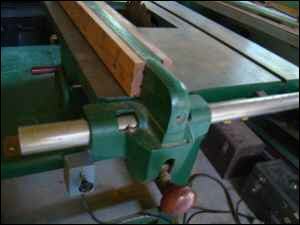 Wide working zone in front of blad makes cross-cutting of 13 inch wide stock easy. Miter gauge rests entirely on the table. Ample 5 1/2" table space behind the blade for outfeed support. Table measures 20" x 27 1/2". Rear Fence Locking Finger is operated from front of fence to eliminate reaching over blade. Safe and handy. Fence can't spring away from blade. Accuracy assured an on even the heaviest work. Includes a finely graduated scale. Adjustable tapered pivot pin removes wear, maintains accuracy. Auto-set stop screws for 45, 90, and 135 degree angles. Accurate for a lifetime. 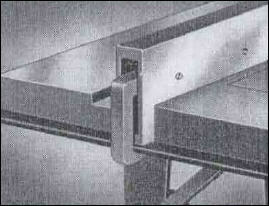 This practical Clamp Attachment (for miter gauge) holds work from creeping away from the blade. It insures accuracy on difficult to hold, miter cuts.